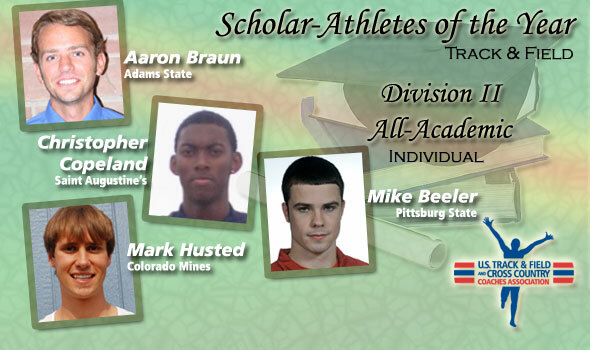 NEW ORLEANS – Aaron Braun (Adams State), Christopher Copeland (Saint Augustine’s), Mike Husted (Colorado Mines), and Mike Beeler (Pittsburg State) were named on Friday as Scholar Athletes of the Year in Division II for the 2010 track & field seasons by the U.S. Track & Field and Cross Country Coaches Association (USTFCCCA). The four represents collegiate track & field’s best in both athletics and academics. In addition, 156 were tapped as USTFCCCA All-Academic honorees. Scholar Athletes are determined from among those who earned All-Academic status and placed highest in individual events at the most recent NCAA Championships. Those who earn multiple individual championship titles rank higher in the tie-breaking process, and cumulative GPA is weighed as the final tiebreaker to establish a winner. Separate awards are given to track athletes and field athletes for the indoor and outdoor seasons, resulting in four categories. Braun, a native of Fort Collins, Colo., won his fifth overall NCAA track & field national title with a 4:07.44 clocking in the mile at the Division II Indoor Championships in March. Braun, a mathematics major, has accumulated a GPA of 3.77 over his academic career. Braun won this award a year ago and is a four-time overall winner of the award in track & field having previously won the award in 2007 and 2008 for the outdoor season. Copeland, a native of Suffolk, Va., was the NCAA Indoor Champion in the high jump with a clearance of 7-½ (2.15m). At the outdoor championships, Copeland lost a jump off for the national crown. Copeland, a sophomore, carries a 3.65 cumulative GPA in sports management. Husted, a native of Westminster, Colo., claimed victory at 800 meters at the NCAA Division II Championships in May with a 1:48.65 clocking. Husted, a graduate student at Colorado Mines, is an electrical engineering student with a 3.96 cumulative GPA. Beeler, a native of Lenexa, Kan., was the NCAA’s runner up in the javelin at the national outdoor championships. Beeler, a junior, has notched a 3.74 cumulative GPA in chemistry. In addition to the Scholar Athletes of the Year, the USTFCCCA also announced the men’s 2010 Division II All-Academic Track & Field team. A total of 156 student-athletes representing 59 institutions compose the group. Pittsburg State, East Stroudsburg, and Ashland led all teams with seven named to the All-Academic list. The GLIAC notched 26 to lead all conferences and the RMAC was runner-up in the category with 21. National champions Reuben Mwei (Adams State) and Leford Green (Johnson C. Smith) those who won Scholar Athlete of the Year honors as All-Academic honorees. To qualify for the USTFCCCA All-Academic Track and Field Team, the student-athlete must have compiled a cumulative grade point average of 3.30 and have met either the NCAA Division II indoor or outdoor automatic or provisional qualifying standard. Those institutions given All-Academic Team status will be named on Monday, August 2 (women) and Tuesday, August 3 (men).